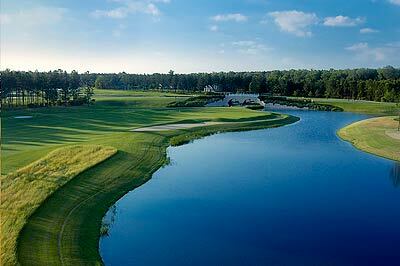 Covering over 1000 acres in the heart of Bluffton, Hampton Hall is one of the areas largest gated golf communities. In 2003 Toll Brothers, the nation’s award-winning builder of luxury homes, setout to create a community that offered the exclusivity of private living paired with a wealth of amenities. Well over a decade later, Hampton Hall has blossomed into its own award winning stature. 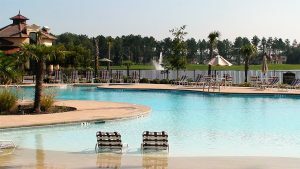 Voted “Best Gated Community” and “Best Golf Course” in 2018 by Bluffton Today, it has become one of the most sought-after communities in the Lowcountry. The impeccably maintained, 18 hole Peter Dye Signature, golf course offers an open design that accommodates players of all levels. There are both a men’s and ladies’ golf society who aim to, “enhance the golf member experience by stimulating camaraderie and sportsmanship”. A independent Golf Clubhouse is home to Pete’s Grill Restaurant as well as a training center to fine tune your game. Amongst the many amenities offered within the gates of Hampton Hall, the state of the art Health and Fitness Center is one of the most prized resource for members of the community. The center offers a complete workout area including a full schedule of group fitness classes. In addition to the capacious outdoor pool area the swim and tennis complex is home to the indoor lap pool. Other amenities include basketball courts, pickleball courts, both clay and hardcourts, as well as a playground to insure there is something for the whole family to enjoy. If you are looking for something a bit more relaxing there is a full service spa that is available to members by appointment. Positioned as one of the main focal points in the community, the European inspired main Club House is a place for members to relax and socialize with friends and family alike. The 22,000 square foot lakefront clubhouse offers a variety of dining areas. 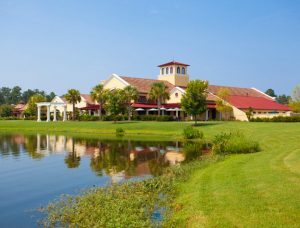 You can grab a bite at the casual pub and grille room, or have a cocktail on the lanai overlooking the lake. In addition to dining, the clubhouse also offers numerous options for private events ranging from rooms available for corporate/business meetings to a banquet room that can accommodate up to 300 guests.